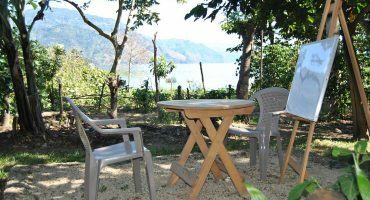 If you want to learn the Spanish language in an unforgettable way and, in the meantime, experience a unique adventure on the shores of the most beautiful lake in the world, Eco Spanish Schools in San Juan La Laguna and Santiago Atitlán are your best options. Every day you'll be able to practice your Spanish with your Guatemalan Family and get involved in the Mayan lifestyle, costumes and culture. An experience you won´t forget. Make life simple and let us help you plan your travel from in Guatemala to the Eco Spanish School. Perfect for solo travellers, groups, families, gap-year students and retired people. We plan adventure tours, accommodation, lessons and volunteer opportunities. With individual attention, we can offer the best possible educational experience. 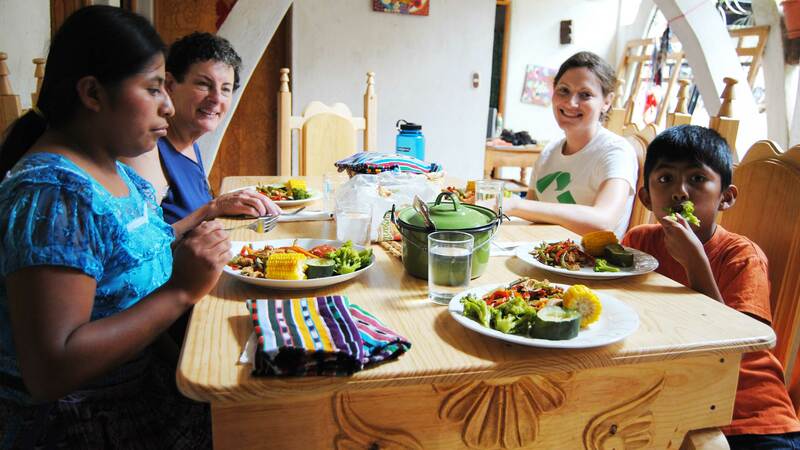 Stay with a Mayan host family for a full-immersion experience. Get the same individual instruction through from anywhere in the world. Participate in a variety of local cultural activities. A complete Spanish immersion program for any level: beginner, intermediate and advanced, as well as courses in the Tz'utujil Mayan language. We are accredited as a “Spanish as second language teaching institution” in San Juan La Laguna. To teach our students with the highest quality standards in the Spanish learning process. To educate visitors about the social, political, cultural and economical reality of Guatemala. To create justly-paid employment opportunities for Guatemalan professionals. To give our students an experience of a lifetime. A stunning learning environment on a coffee farm. Guided visits to engage in cultural experiences. Free organic coffee, tea and bread during your breaks every day. 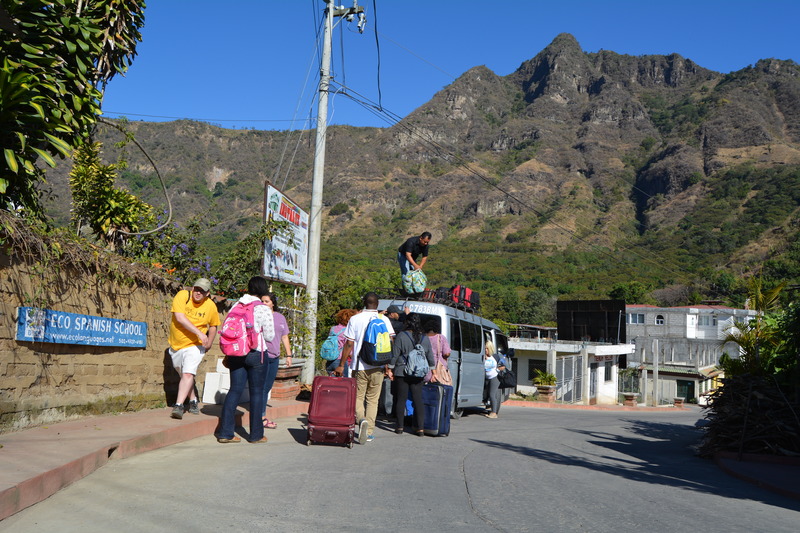 The first Spanish School in Lake Atitlan to introduce daily social and cultural activities as part of the Spanish immersion program. First Spanish program to require university level graduated teachers. The only school to use the Whole Language as the main methodology in our Spanish classes. Mi Experiencia en la escuela fue el 100% positivo, aprendí muy rápido con mi maestro y con mis ejercicios. La Eco Sp. Tiene materiales fáciles para hablar, escribir, leer y escuchar español… Viví, comí, aprendí mucho de la cultura Maya Tz'utujil con la familia de Angélica y Agustín…...GRACIAS ECO SPANISH SCHOOL SAN JUAN ! 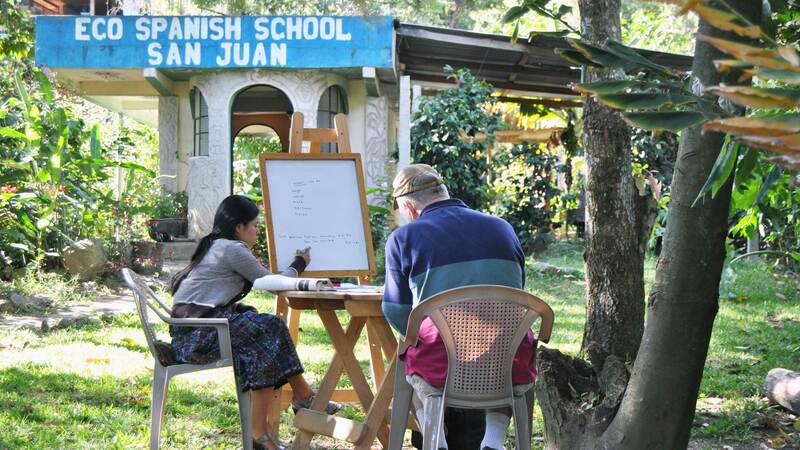 Eco Spanish school offers a wonderful opportunity to learn and practice Spanish in a beautiful, friendly small town. San Juan was an idyllic setting for me to study and speak Spanish every day. My teacher helped me to learn quickly and challenged me to express myself--the one on one instruction is ideal as you learn at your own pace and about subjects that are meaningful to you. A complete experience to study in this school, I improved very quickly my Spanish with my teacher María in a few weeks. In the picture, yo parezco como una mujer maya…. Gracias Familia Alvarez. También gracias a la Eco Escuela. We offer a complete Spanish immersion program for any level: beginner, intermediate and advanced, as well as courses in the Tz’utujil Mayan language. We are accredited as a “Spanish as second language teaching institution” in San Juan La Laguna. Stay with a local host family and get a full-immersion experience that will dramatically improve your learning. You will get a private room with 3 meals per day with the family except on Sundays. Get started before you arrive or extend your learning afterwards. 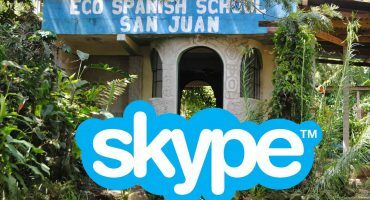 We also offer the opportunity to offer languages courses through Skype no matter where you are in the world.